Among the many things that make New York one of the world's greatest cities is the abundance of cultures that it is home to. And often, in this crucible of creativity where diverse ideas, ideals, art forms and people rub shoulders and feed off each other, unexpected elements join forces in a synergetic fusion that results in something that can be beautiful, fresh, dynamic and thought-provoking. A few days back, I witnessed the best of what can happen in New York when two seemingly disparate worlds meet and spark an entirely new vision and outlook. At a performance titled "Pratyaksha: Painting with Dance" (Pratyaksha means perspective in Sanskrit), the various art movements of 19th and 20th century Europe served to inspire and enrich Bharatanatyam. 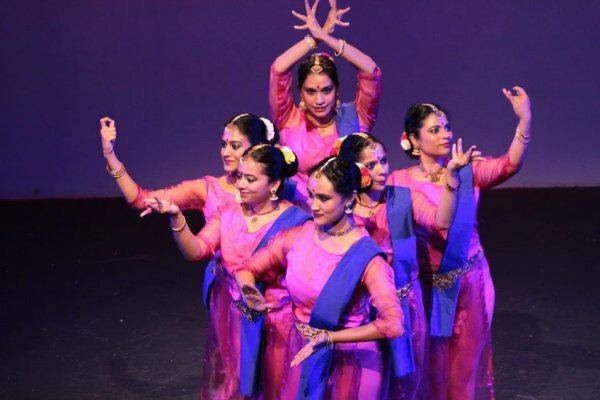 It was presented by the New York City based Aalokam Dance Company, which was founded by Bharatanatyam dancers Bharathi Penneswaran and Jyothsna Kalyansundar. Working off their strong foundation of rigorous training under some of India's best gurus, they have brought their dance to this city with a passion and intelligence that is a real pleasure to behold. For any art form to thrive, remain relevant and even simply just survive, it has to evolve and adapt to its environment. And that is exactly what Bharathi, Jyothsna, and Aalokam have done with Bharatanatyam. They have embraced all that New York has to offer and have used their aesthetic sensibility and creative imagination in their choice of what they have brought into the fold of Bharatanatyam. The tremendous political, social and economic upheaval of 19th and 20th century Europe resulted in a corresponding ferment in the art world. Painters, who had until then depicted the world around them with as much realism and exactness as they could manage, no longer felt that those methods adequately represented the turmoil they saw and felt all around them. Grappling with new and different ways to illustrate and characterize their epoch, they shocked, enthralled, puzzled, thrilled and angered the world with Impressionism, Cubism, Expressionism, and a whole host of other isms. Across the globe, Bharatanatyam also endured great turbulence and a near-death experience in the mid-1900s as the centuries old institution of temple dancers - the Devadasis - was deemed backward and morally corrupt and was abolished. Thanks to the efforts of people like E. Krishna Iyer, Rukmini Devi Arundale and several others, the dance was spared the fate of oblivion and was steered forward into the brave new world of concert halls and commercial productions. Like western art, Bharatanatyam too, adapted in order to survive in a vastly changed milieu. It has traveled far and wide from the land of its birth and has found a home, eager audiences and practitioners of all stripes and persuasions across the world. I have long been fascinated by the cross-pollination of cultures and am filled with admiration with those who dare to break the shackles of "tradition" in order to advance and enrich their art. So I was delighted to attend Aalokam's Pratyaksha performance, to watch "the deconstruction of Bharatanatyam's foundations of nritta, natya and nritya, and their exposure to inspirations in modern art movements" and see how their performance would use "classic Indian dance to explore, experience and expose art movements including Cubism, Impressionism and romanticism, among others." The performance was at Dixon Place, an apt choice given that it was in a neighborhood that embodied the essence and many elements of nearby Chinatown, Soho and the Lower East Side. The stage was spacious, giving ample room for the seven dancers to move unrestrictedly. There was a live orchestra which was a wonderful treat, especially given the superb quality of the musicians. Unfortunately, I arrived a few minutes late and missed most of the opening performance by a group of adorable children. It was heartwarming to see the joy and uninhibited enthusiasm with which they danced. And then, it was time for the main event. The items were based on the traditional Bharatanatyam margam. The program began with an alarippu in the 5-beat khanda chapu talam. It was influenced by Cubism, the art form made famous by the maverick Spanish genius Pablo Picasso. In painting, Cubism is a radical departure from the traditional representation of the body in space; the familiar is made unfamiliar and is broken down into geometric shapes that show multiple sides of a thing at once. The Cubist Alarippu was, I thought, fantastic. It broke down the different elements of the alarippu - the rhythm, the spoken word, the body movements - and then joined them together in a variety of formations. It was a kaleidoscope of movement, a fractured, fragmented alarippu, the whole broken into parts that formed and re-formed a variety of patterns. Bharatanatyam is most often danced solo. The alarippu was performed by all seven Aalokam dancers. When a group dances, it is rare to see the kind of synergy and wonderful use of space that these dancers displayed. Cubist paintings are difficult to understand and appreciate the first time around. That was not the case with the Cubist Alarippu - for me, it was love at first sight and sound! Next up was a jathiswaram in the ragam Kalyani, set to the seven-beat misra chapu talam. This piece took its inspiration from Impressionism, the art movement that so enraged the traditionalists of the Salon of France when painters like Monet, Degas, Renoir and Manet exhibited their work using entirely new techniques and brushstrokes to emphasize the impression of flickering light and fleeting movement, a far cry from the heavy-handed realism that prevailed and was appreciated at the time. Aalokam's nod to Impressionism was to be in the lighting for the piece that was to show the passage of time, from dawn to dusk; in addition, some of their movements would suggest the erratic brush strokes of the Impressionists. To me, the lighting barely made a dent on my consciousness; perhaps it was too subtle and I missed something. But a captivating gathi bhedam section (where the rhythmic gait of the music changes, and feels unsteady and unsettled) was a perfect way to capture the idea of irregular brush strokes. Here again the dancers created some lovely formations, representing the Impressionist concept of the ephemeral and transitory. The joyous dancing evoked the sights and sounds of nature, so dear to the Impressionists. As in the traditional Bharatanatyam margam, the varnam was the main item for this performance. This varnam had Romanticism as its muse. Musicians like Beethoven and Chopin and poets like Byron and Shelley are who come to mind when we think of Romanticism, but this movement, which had its origins in the literary and music worlds, inspired painters too, like Goya and Delacroix. The hallmark of this movement is its immersion in the sweep and span of moods and emotions, from the storminess of angst, passion and anger to the quieter ones like tranquility, sorrow, devotion and love. And so of course the Nava Rasas (love, laughter, sorrow, anger, disgust, courage, fear, surprise and tranquility) of Indian classical dance fit like a hand into a glove into the concept of Romanticism. The varnam was on the powerful Goddess Devi - Simhavahini Sri Rajeshwari in Ranjani ragam and adi talam, a composition of the contemporary composer Madurai R Muralidharan. With the growing power of women's voices thanks to the MeToo and other similar movements, this was a great choice, also fitting as the dancers are all strong, dynamic and immensely talented women. The varnam was a true celebration of the power of women. Power comes in many guises and can find expression through many moods and emotions, from brute strength and force to calm focus to joy. This varnam included them all. It was beautifully choreographed, with each dancer having her own role and space to create and express her dance. The theermanams - the pure dance fillers between the expressive segments - told tales too, and incorporated the spirit of the song. True to the spirit of Romanticism, the varnam spanned an array of emotions, and it also evoked the colors, mood and movement of a world brimming with life. After the thunder and drama of the varnam, the mood turned mellow with padams, songs of the intense fervor of love and longing. And what better stimulus for this than Expressionism, the art form of larger than life colors and brushstrokes, which, like the padam, expresses the powerful and vivid impact of emotions?! Two padams were presented, one by Bharathi, the second, by Jyothsna. Bharathi's abhinaya is among the best I have seen. Her portrayal of "Dari joochu" in Shankarabharanam brought to vivid life the delicious anticipation, fantasizing and ultimately, disappointment, of a woman waiting for her lover. In the hands of any but the most skilled exponent of abhinaya, a padam can drag and seem repetitive. But Bharathi kept us rapt as we felt the intensity of her longing along with her. There were some clever choreographic touches too as a couple of dancers streaked across the stage like mischievous sprites, evoking the burning wind that scorched the waiting lover's soul. Jyothsna followed with a change of mood and tone with "Idhai vida innum veru vendumo saatchi" in Saveri. The controlled fury with which she depicted the heroine's reaction to her cheating lover was fantastic. It is all too easy to over-emote in a padam that can turn it to a farcical caricature but Jyothsna hit the perfect spot. As she danced, another dancer performed a variety of moves off to one side at the back, an abstract kinetic complement to the music that added an element of rhythm to the slow flowing padam. The performance ended with a thillana, a joyous piece, full of life and energy, with complex percussive elements in addition to a short abhinaya section. The art movement that the thillana fed off of was Abstract Expressionism, which uses abstract forms to depict and convey not just deep and primal emotions but also universal truths about the human condition. The thillana, with its abstract rhythmic patterns and abhinaya section perfectly complemented the objectives of Abstract Expressionism. Set to the lilting Hamir Kalyani ragam it was everything and more a thillana can and should be, a celebration of life and love. It even conjured up the colorful spirit of the Indian spring festival of Holi: each dancer had her palm daubed with paint. The ringing applause and standing ovation that greeted the performers showed just how much this performance was enjoyed by the filled-to-capacity hall. Dance is never performed in a vacuum; the music that accompanies it can make or break it. For the Pratyaksha performance the music was outstanding. The vocalist was Vignesh Ravichandran, who sang with so much feeling and joy, his rich, deep voice a real pleasure to listen to. He was ably assisted by another talented young artiste, Neha Krishnamachary on the violin. Anuradha Renganathan's nattuvangam was crisp and dynamic. Bala Skandan was wonderful, as always, on the mridangam. The dancers - and the audience - were fortunate to have such lovely music from the orchestra. The dancers were beautiful and graceful and each one displayed the fruits of top-notch training, hard practice and superb conditioning. Rather than the full Bharatanatyam costume, they wore lighter costumes of pink and blue, a celebration of the colors of spring and summer. Every one of them - Bharathi, Jyothsna, Abinaya Narayanan, Varsha Radhakrishnan, Namita Devadas, Parinatha Sampath and Akshata Rangarajan - was a delight to watch, and each one brought her own particular grace and charm to the performance. This is a dance company to watch out for - they will go far. How often have we heard those famous lines from Rudyard Kipling's The Ballad of East and West - "Oh, East is East and West is West, and never the twain shall meet...."
At Aalokam's Pratyaksha, the twain did meet. Kamini Dandapani lives in New York City and has had extensive training in Carnatic music, Bharatanatyam and classical pianoforte. She writes on a variety of topics related directly and tangentially to South India on her blog, Tales of South India.